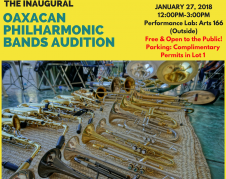 Bilingual Spanish-Mixteco program mixes traditional and contemporary Chilena music from the Mexican states of Oaxaca and Guerrero, with dedications and greetings that connect migrant families and communities across borders. 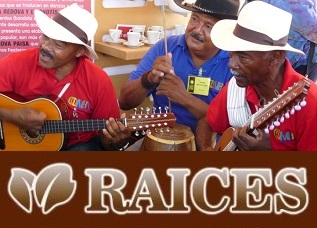 Each program includes a special half-hour of traditional music from the different indigenous regions of Oaxaca, as well as community dialogue and information, from noon to 12:30 pm PT Announcers Spanish and Mixteco. 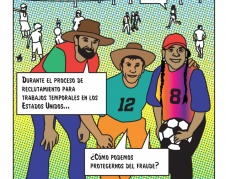 (Español) Campañas educativas para prevenir fraude laboral. 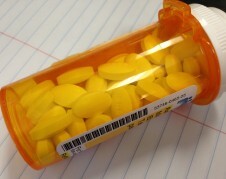 This show highlights labor law protections for victims of workplace sexual harassment and assault. 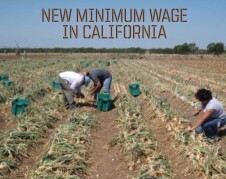 New minimum wage standards will start on July 1st in California. 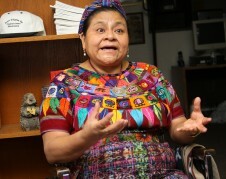 Recently, the distinguished Guatemalan, Rigoberta Menchú, Nobel Peace Prize, spoke to indigenous organizers in Fresno, California, and their allies. 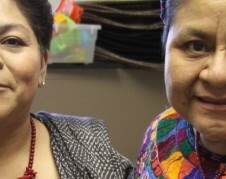 Menchú spoke about recent triumphs and celebrated the beauty of indigenous languages, among other messages. 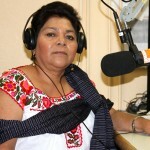 Juana Gómez, host of La Hora Mixteca on Radio Bilingüe, interviewed the well-known defender of the rights of Native peoples. Ilse Gallardo from Fresno’s Centro La Familia en Fresno speaks about healthcare coverage. La Hora Mixteca originates live every Sunday from Radio Bilingüe studios in Fresno, California.